Harsh weather of the late season can cause hunters to stay at home. That’s a shame because late season weather fronts can be golden for the hunter who is willing to brave the conditions. He’s gone now, but after all these decades, this seeming overly simplistic advice has become the cornerstone of my late season hunting strategies. The advice to stay in the stand when the deer are moving and feeding is solid, but most hunters don’t follow the second part of the equation; the part where you go on the offensive and go to the deer when they are bedded down. This advice is never more true than during a late season when the deer are hunkered down in thick cover waiting out a snowstorm. If a deer can have a puzzled look on its face, this doe had one as she looked up from her bed and saw me hunkered down in the swirling snow only 12 feet away. She looked as if she simply couldn’t believe what she was seeing. She didn’t even get up as I moved off. I didn’t find the buck I was after on that particular outing, but I learned something. Deer just aren’t accustomed to seeing hunters out in their thick bedding areas during a blizzard. But think about it; what better time to still hunt through thick bedding cover than when the deer’s ability to detect your sound scent and sight is diminished? When the weather is nasty, bucks head to the creek bottom thickets, standing corn and cattail sloughs where they can hunker down out of the wind to wait out the storm. Moving through these areas with great caution can put you shockingly close to a mature buck. In addition to their diminished ability to detect danger due to the conditions, they tend to let their guard down. Deer are so unaccustomed to seeing a person in there during these times that they often pause upon recognizing you, giving you enough time to get off a shot. This is especially true in cattail sloughs and in standing corn fields. I have shot deer in their beds from 2-3 yards when they had no clue I was on the planet. Move slowly with the wind in your face as much as possible, picking your way along, step by painstaking step. Visualize everything around you looking for parts of deer and movements such as the flicker of an ear or turn of a head. You won’t see whole deer, you’ll see parts of them, then you can plan your final approach. We’ve all noticed that the deer pile into the feeding areas whenever a storm ends in the afternoon. I once watched this phenomenon from the seat of my pickup, but these days, I want to be in the stand as the storm ends. Today’s technology puts radar right at our fingertips. By viewing the radar on a phone or tablet, we can predict the moment the snow will end and I want to be in the stand when that happens. 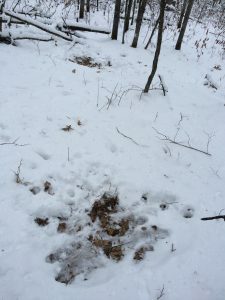 By heading to a stand positioned over a food source a half hour before the snow quits, I have allowed my tracks and most of my ground scent to be covered up by snow, and I am position to strike when the deer appear. All this, of course, takes some planning ahead of time. Glassing and using scouting cameras will tell you where the deer are most likely to appear in the fields. Additionally, knowing the bedding areas the deer use during harsh weather fronts also gives you an advantage. 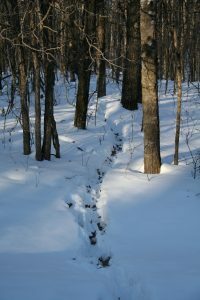 In the winter, deer use two primary kinds of bedding areas. I call them thermal bedding areas and solar bedding areas. The thermal areas are the ones I mentioned earlier where the deer tuck in out of the wind in the thick stuff during cloudy, windy and snow or rainy conditions. Solar bedding areas are preferred during sunny days even when the thermometer drops to the bottom. Following a storm, a cold front usually moves in with high blue skies and northwest winds. Deer will find a south-facing slope where they can take advantage of the sun’s warming rays while the wind blows over the top of them. I’ll find beds right on the back side of a ridge. The bucks like to bed here because they can smell what’s behind them and see the area in front of them. These areas usually have little to no thick ground cover because of tree canopy, so the deer can get plenty of sun. Knowing if the deer are more likely to be bedding in a solar bedding area or a thermal bedding area—and knowing where these areas are located–will be a big advantage in your decision of where to set up to ambush them on their way to their evening feeding spots. In the winter, deer need to eat a lot to create the body heat necessary for survival. That means they will take chances with daylight feeding patterns they wouldn’t take when the living is easy in the early season. You may see mature bucks feeding in open fields fully two hours before dark, which is the middle of the afternoon where I hunt in the upper Midwest. These deer may be pawing down through the snow to get to alfalfa or clover if there is nothing else available. But if they can find high-carb foods, that’s where they will gather. Picked cornfields are deer magnets during the late season because corn is high in carbohydrates. 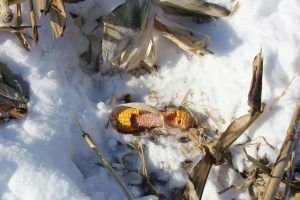 Bucks need loads of carbohydrates to replenish fat reserves lost during the rigors of the rut so they will head for areas that have corn when it’s available or search out the remaining mast crop that may still be available. To most of us in whitetail country, when we talk about mast, that means acorns. Find any place where the acorns aren’t cleaned up and you will find deer there at any hour of the day. Soybeans have carbohydrates but also high levels or protein, which can be more readily converted to energy than carbs, which are more easily stored as fat. When the weather is so bad that the deer are basically a day-to-day survival mode, soybeans are a boon to them. 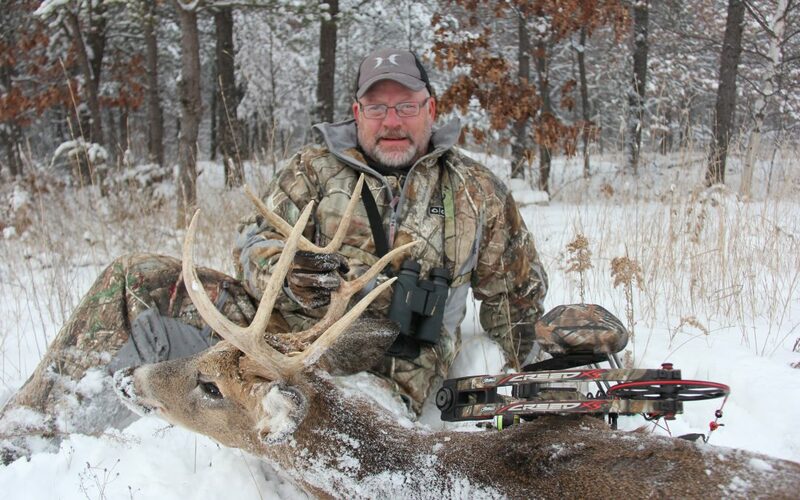 Take the example of the huge 197-inch Illinois typical shot by Steve Niemerg. This is a hunter who took the term “Die-hard” to a whole new level. 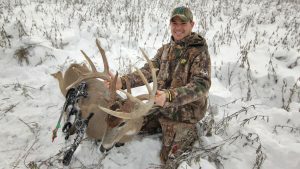 A blizzard hit while Steve and his friend Justin were out bowhunting the first week in January. Rather than head for the truck, he stuck it out, but didn’t see any shooter deer. When he got back to his truck, he discovered it was stuck in a snowbank and wouldn’t move. Walking to a farmhouse, Steve and Justin were welcomed by a local who fed and housed them for two nights until the front moved through and the snow stopped blowing. Did Steve dig out his truck and go home when the storm ended? Nope, he knew just where he and Justin wanted to be: sitting in a stand overlooking some standing soybeans. That day he was rewarded with a world class Illinois giant which will forever be known as the “Blizzard Buck” in the annals of Illinois deer hunting history. 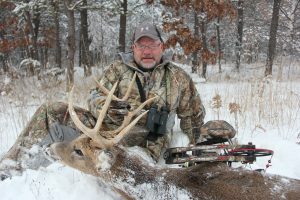 Steve’s story took place on private land managed for whitetails, but for those of us who hunt mostly public land, this late-season hunting of weather fronts has another significant advantage. The throngs of hunters who were moving over the landscape during November are now at home in the recliner with a hot chocolate in one hand and a remote control in the other. 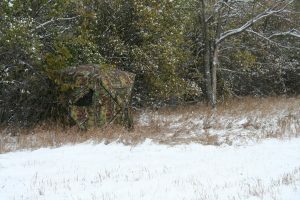 You are likely to have most public hunting land entirely to yourself if you are willing to brave the harsh conditions. During much of the season, the advice to go deep on public land to avoid the crowds is good advice. But during the late season, you will find more success hunting the edges of the land anywhere it abuts private farmland where food is available for the hungry deer herd. Scouting these snow-covered areas is ridiculously easy: find the tracks and trails and you find the deer. They can’t hide what they are doing, it’s written there for all to see. Put some scouting cameras out to verify the makers of the trails and then set up a stand accordingly. If you find yourself with an unfilled tag and the weatherman is predicting a front coming through your area, don’t be one of the remote punchers, be one of the few tag punchers who take advantage of the conditions.